No trip to Delhi would be complete without a visit to one of the bazaars that surround Chandni Chowk (Moonlight Square) in Old Delhi, where shops and stalls display a wonderful array of goods, and offer a pungent and colourful insight into everyday Delhi life. Chandni Chowk has a large number of galis (lanes) and each one is different, with its own atmosphere and selection of goods to buy. Naya Bazaar, on Khari Baoli, is the spice market, displaying a wonderful range of seasonings in neat, colourful piles. 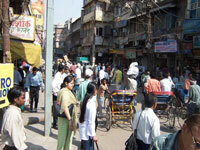 The nearby Gadodia Market is the wholesale spice market. Hundreds of spices and condiments can be found there, including aniseed, ginger, pomegranate, saffron, lotus seeds, pickles and chutneys, to name just a few. Chor Bazaar sits behind the ramparts of the Red Fort and comes to life on Sundays to trade a collection of 'second-hand' goods. Chawri Bazaar was once notorious for the ladies who beckoned men from the arched windows and balconies above the street, but today these houses have made way for shops specialising in brass and copper Buddhas, Vishnus and Krishnas. Some of the busiest galis (east of Kalan Mahal) house the poultry and fish markets, but most tourists wisely avoid these areas.